Google has released the Environmental Insights Explorer, a tool that visualizes individual cities’ building and transportation carbon emissions. 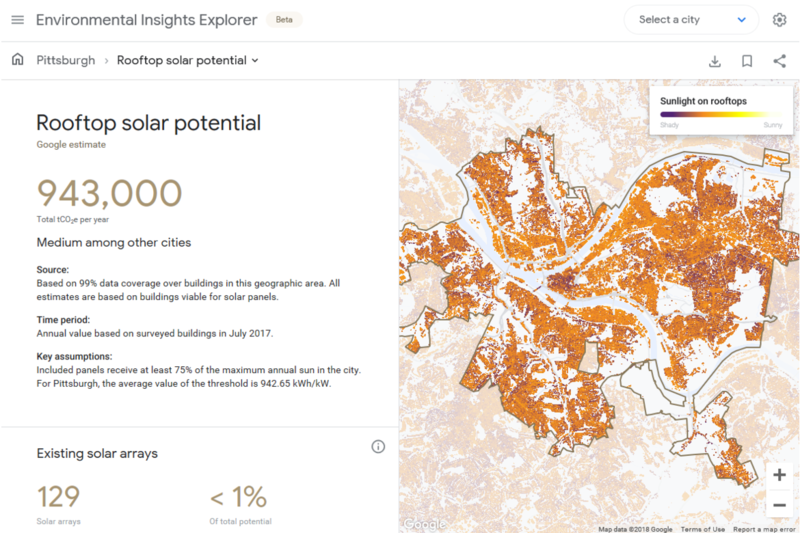 The tool’s maps and charts also illustrate cities’ potential to develop solar power. For example, visualizations show that 72 percent of buildings in Pittsburgh have the potential to generate solar power from their roof. The carbon emissions reduction that would occur if these buildings reached their rooftop solar power potential would be equivalent to taking 199,000 cars off the road for one year. Users can visualize emissions data for five cities—Buenos Aires, Melbourne City, Victoria, Mountain View, and Pittsburgh—and Google plans on adding more cities to the tool.